Among the many things I love about this ministry is this-the necessity to read a multitude of genres. While I might always order the same thing at Anita’s Mexican Restaurant, (the Coast Highway location for you San Diego County readers) I have learned to love variety in my reading over the years. Lloyd Jones on the Christian Life by Jason C. Meyer is a book that checks a lot of genre boxes. Part of Theologians on the Christian Life series by Crossway, this book looks at Lloyd-Jones' life, his doctrine, the Christian life, and his legacy. Like many of the theologians in this series, you may have read many quotes by them in other works, but be unfamiliar with the scope of their ministry and how it continues to impact the world for Christ. I had heard a little of Lloyd-Jones story before, the medical doctor who became a preacher, and while the biography portion of the book is concise, it brings into focus much of what shaped his ministry views. As for his doctrinal views, which were sometimes controversial, the book does a good job of outlining them and then supporting them with quotes or passages from a variety of Lloyd-Jones teachings. This isn’t a fanboy book, the author deals honestly with areas of theology where he disagrees with Lloyd-Jones, and overall I felt it balanced and helpful. 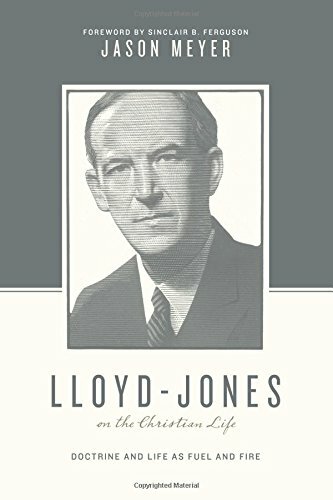 This is a good book for someone who would appreciate an overview of the life and influence of Lloyd-Jones as an introduction to the man and his ministry. Read well (and widely) friends!